Cristelle Baskins, Tufts University, review of Nick Wilding, Galileo’s Idol: Gianfrancesco Sagredo & the Politics of Knowledge. University of Chicago Press (Chicago, 2014). Gayle K. Brunelle, California State University, Fullerton, review of Chloë Houston, The Renaissance Utopia: Dialogue, Travel and the Ideal Society. Ashgate (Farnham, UK and Burlington, USA, 2014). Kristin Bundesen, Walden University, review of Joy A. Schroeder, Deborah’s Daughters: Gender Politics and Biblical Interpretation. Oxford University Press (Oxford, 2014). Timothy Duffy, New York University, review of Marjorie Rubright, Doppelgänger Dilemmas: Anglo-Dutch Relations in Early Modern English Literature and Culture. University of Pennsylvania Press (Philadelphia, 2014). Victoria H. Ehrlich, Cornell University, review of Erin J. Campbell, Stephanie R. Miller, and Elizabeth Carroll Consavari, eds., The Early Modern Italian Domestic Interior, 1400-1700: Objects, Spaces, Domesticities. Ashgate (Surrey, UK, 2013). Jeanette M. Fregulia, Carroll College, review of Martin Jacobs, Reorienting the East, Jewish Travelers to the Medieval Muslim World. University of Pennsylvania Press (Philadelphia, 2014). Carole Collier Frick, Southern Illinois University Edwardsville, review of Elizabeth W. Mellyn, Mad Tuscans and Their Families: A History of Mental Disorder in Early Modern Italy. University of Pennsylvania Press (Philadelphia, 2014). Philip Gavitt, Saint Louis University, review of Constance Bouchard, Rewriting Saints and Ancestors: Memory and Forgetting in France, 500-1200. University of Pennsylvania Press (Philadelphia, 2015). Katherine Gillen, Texas A&M University-San Antonio, review of Brooke Conti, Confessions of Faith in Early Modern England. University of Pennsylvania Press (Philadelphia, 2014). Elizabeth Hodgson, University of British Columbia, review of Alice Eardley, ed., Lady Hester Pulter: Poems, Emblems, and The Unfortunate Florinda. The Other Voice in Early Modern Europe: The Toronto Series, 32, ITER (Toronto, 2014). Steven Matthews, The University of Minnesota Duluth, review of Derek Krueger, Liturgical Subjects: Christian Ritual, Biblical Narrative, and the Formation of the Self in Byzantium. University of Pennsylvania Press (Philadelphia, 2014). Maureen E. Mulvihill, Princeton Research Forum, review of Peter M. Daly, The Emblem in Early-Modern Europe: Contributions to the Theory of the Emblem. Ashgate Publishing Ltd. (Surrey UK and Burlington USA, 2014). Laura Schechter, University of Alberta, review of Claire Sponsler, The Queen’s Dumbshows: John Lydgate and the Making of Early Theatre. University of Pennsylvania Press (Philadelphia, 2014). Colleen M. Seguin, Valparaiso University, review of Tanya Stabler Miller, The Beguines of Medieval Paris: Gender, Patronage, and Spiritual Authority. University of Pennsylvania Press (Philadelphia, 2014). Lauren Shook, University of North Carolina Greensboro, review of Alison V. Scott, Literature and the Idea of Luxury in Early Modern England. Ashgate (Farnham, 2015). Amy D. Stackhouse, Iona College, review of Margaret J. M. Ezell, ed., “My Rare Wit Killing Sin”: Poems of a Restoration Courtier, by Anne Killigrew. The Other Voice in Early Modern Europe: The Toronto Series, 27, ITER (Toronto, 2013). Larry Swain, Bemidji State University, review of Shirin A. Khanmohamadi, In Light of Another’s Word: European Ethnography in the Middle Ages. University of Pennsylvania Press (Philadelphia, 2014). Elspeth Whitney, University of Nevada, Las Vegas, review of Mathew Kuefler, The Making and Unmaking of a Saint: Hagiography and Memory in the Cult of Gerald of Aurillac. University of Pennsylvania Press (Philadelphia, 2014). This article explores the practice of reprinting old news in disguise as new news in early modern England. It traces the story of the most well-known example of this practice, an account of a woman haunted by a headless bear, alongside a number of other examples. New instances are presented, and new information about more well-known examples is offered. Conclusions are drawn about the reasons for the practice and its wider meaning for the early modern news trade. The article also adds new information on the development of the image of the headless bear itself. 1> In 1584 bookseller Thomas Nelson published a strange and disturbing piece of news. The report told of a woman possessed by the Devil in Somerset, although this was not what made it particularly strange. 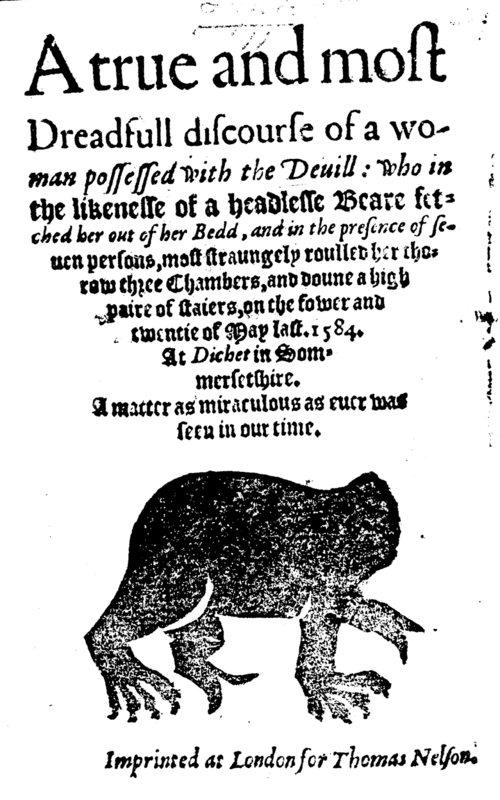 Rather, it was the apparition which haunted her bedside which makes this pamphlet stand out: a bear without a head. 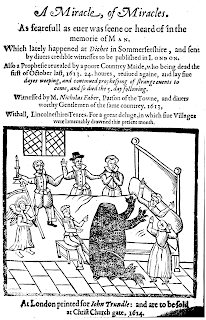 Interesting enough in its own right, the story of the headless bear does not end there, however, nor with the possibility that among the pamphlet’s early readers was William Shakespeare. The story was reprinted, not once but twice, with around thirty years separating each reprint – both times in disguise, as a piece of new news. It is not the only example of the practice of republishing old news for new in the English book trade, a phenomenon which has received very little scholarly attention. Other known examples are reports of almost as sensational events. The story of the headless bear offers an illuminating insight into this unscrupulous practice. This article traces that story, along with that of some similar examples, in an attempt to determine just what these reprints meant for the news trade in early modern England. 2> The account originally appears in a pamphlet advertised on its title-page as A true and most Dreadfull discourse of a woman possessed with the Deuill: who in the likeness of a headlesse Beare fetched her out of her Bedd, and in the presence of seuen persons, most straungely roulled her thorow three Chambers, and downe a high pair of staiers, on the fower and twentie of May last. 1584, a single sheet in octavo. 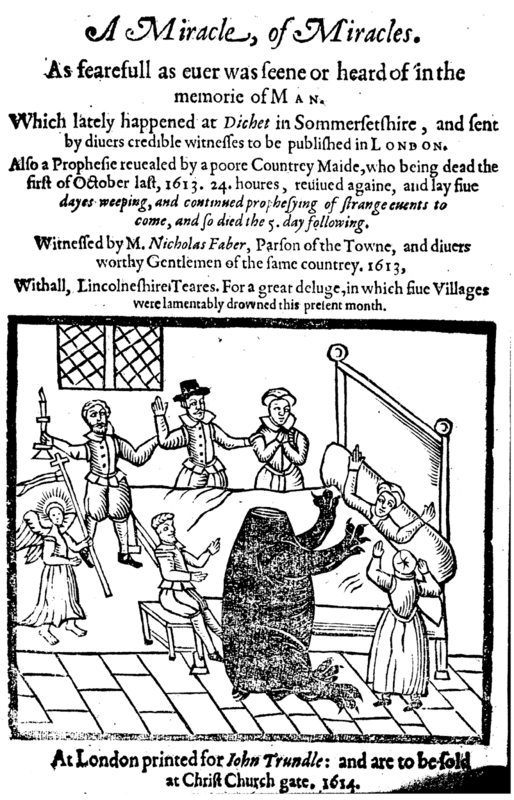 The title-page goes on to pronounce the events ‘A matter as miraculous as euer was seen in our time.’ The pamphlet’s title page presents a woodcut for readers unable to visualise a headless bear (possibly specially cut for the pamphlet, but it could perhaps be an older woodcut which had been decapitated for the purpose). The pamphlet is undated but the wording of the title dates it to the same year as the events it reports. tooke her out of the bed, and so roulled her to & fro in the Chamber, and vnder the bed... At the last this Monster which we suppose to be the Deuill, did thrust the womans hed betwixt her legges, and so roulled her in a rounde compasse like an Hoope through three other Chambers downe an high paire of staires in the Hall, where he kept her in the space of a quarter of an hower... There was suche an horrible stincke in the Hall, and such fierie flames, that they were glad to stoppe their noses with cloathes and napkins. 6> Eventually, after having been returned to her bed, the woman sees a vision of ‘a thing like vnto a little child with a very bright shining countenaunce, casting a greate light in the Chamber’; once again the rest of the party see it too. They all praise the Lord and Cooper is cured. 7> Although the apparition and the treatment it subjects its victim to are particularly bizarre, in all other respects the pamphlet is a typical example of a number of cases of diabolic possession reported in cheap print in early modern London; apparitions were not uncommon. The pamphlet is also characteristic of the occasional news pamphlet genre more widely, which tended to treat all out-of-the-ordinary events in a similar way. A preface to the reader offers a typical moralistic spin, claiming that the report demonstrated ‘how redy Sathan is to take hold on vs if we fall from God neuer so little’. ‘These and suche like examples (good Reader)’, it continues, ‘warneth vs to be watchfull for the day of the Lorde which is at hand, least sodainly his wrath be kindled against vs.’ Phrases such as this were clichés of this kind of reporting, whatever the subject matter; partly an attempt at interpretation, partly a commercial imperative, a response to the tastes of their readership. 8> At the end of the pamphlet there appears a list of ‘VVitnesses, that this is most true.’ Six names are listed: Steven Cooper, John Cooper, Ales (Alice) Easton, John Tomson, John Anderton and Miles Foster, ‘With diuers others.’ This was another common practice of early modern news reporting. The relationship between print and truth was particularly vexed in the sixteenth and seventeenth centuries, and printed works were required to gesture towards external sources for verification of their contents. We might consider such ‘verification’ particularly necessary in such an extraordinary case as this, but the practice of listing witnesses (among other similar methods) was not limited to news of supernatural events and therefore does not in itself tell us anything about the expected reaction to the pamphlet’s report. 9> We know little about Thomas Nelson, the pamphlet’s publisher. He appears to have been in business for just over a decade; A true and most Dreadfull discourse is his earliest known publication. Nelson registered a number of ballads, while his extant output consists predominantly of news pamphlets. The headless bear pamphlet is not alone among Nelson’s publications in dealing with supernatural phenomena, though in general Nelson’s known pamphlets reported military news, particularly relating to the wars in France. His output is overwhelmingly marked by topicality, however, and the headless bear pamphlet does not stand out in this respect. 10> But this is not, of course, the end of the headless bear’s story. In 1614 bookseller John Trundle published a pamphlet entitled A Miracle, of Miracles. As fearefull as euer was seene or heard of in the memorie of Man. Which lately happened at Dichet in Sommersetshire, and sent by diuers credible witnesses to be published in London. This pamphlet’s title-page featured a more elaborate woodcut of a familiar scene (this time undoubtedly cut specially – indicating that this pamphlet was not the cheapest of publications). This was not a reissue, as has been claimed, nor even a second edition as usually interpreted (though it was technically that): it was a new edition disguised as a first edition of a new piece of news. Many are the woonders which hath lately happened, as of suddaine and straunge death vpon periured persons, straunge sights in the Aier, straunge birthes on the Earth: Earth quakes, commetts and fiery Impressions, and all to put vs in mynde of God, whose woorkes are wonderfull. Many are the wonders which haue lately happened, as of sodaine and strange death vpon periured persons, strange sights in the Ayre, strange births on the Earth, Earthquakes, Commets, and fierie Impressions, with the execution of God himselfe from his holy fire in heauen, on the wretched man and his wife, at Holnhurst in Hampshire; written by that worthy Minister maister Hilliard; and all to put vs in minde of God, whose workes are wonderfull. 12> As well as the advert for Hilliard’s pamphlet, this passage demonstrates how the reprint was not set from the original but written out and edited, with consequent alteration in spelling. The preface is signed ‘Your friend, T. I.’ (this is perhaps Trundle, initials reversed). The only notable difference in the report itself is that where the 1584 printing names a number of clerics who were present, Trundle’s edition only mentions ‘many godly learned men’. Dates have also been changed: this time events begin on the 9th of September, rather than on the 9th of May (because Trundle’s pamphlet was printed later in the year – it was registered in November). 13> The headless bear had yet further to go. In 1641 bookseller John Thomas published a pamphlet whose title-page advertised it as Most Fearefull and strange Nevves From the Bishoppricke of Dvrham, Being a true Relation of one Margret Hooper of Edenbyres, neere the River Darwent in the said Bishoppricke. Who was most fearefully possessed and tormented with the Devill, as also in what ugley shape he first appeared unto her, how lamentably she was handled with this evill spirit, and at last how wonderfully the Lord delivered her. This crudely-printed quarto is a verbatim reprint of Trundle’s edition; it includes the preface, although it is incorporated into the main body of the text, and the advert for Hilliard’s pamphlet is omitted. Thomas’s version has no illustration to show us what the headless bear looked like, and it is not mentioned on the title-page: what was once a selling-point is no longer considered to be such. This may even be part of an attempt to disguise the fact that the pamphlet is a reprint of old news; although if this were the case the deception would last only until the pamphlet was read (but as long as this was after purchase, perhaps it did not matter). 14> This time round further changes to the circumstantial details are made. Events begin on the 15th of November; Ditcheat in Somerset and Rockhampton in Gloucestershire become Edenbyres (Edmundbyers) and Hanstonueth (Hunstanworth) in County Durham. Once again a list of witnesses is printed at the end (in this edition they are also advertised on the title-page): this time the witnesses are Steven Hooper, John Hooper, John Iley (or Sley, as the title-page reads), Alexander Egleston, Anthony Westgarth and Alis Egleston. The names have been changed, but not unrecognisably so: Cooper has become Hooper; Easton has become Egleston. The plot thickens, however, because – inexplicably – some of these names at least appear to be those of real people. A nineteenth-century editor of the pamphlet claimed that five of them could be identified, but did not provide references. There certainly was at least an Alexander Egleston who lived in Hunstanworth; he died in 1642. The Eglestons had a long history in the area. It seems that the 1641 editor knew the area (the geography is also sound), and borrowed names that were close to those on the original pamphlet. But why? Having real names surely makes the practice more, not less, risky, as they were real people who could verify that the account was not true. It seems to be certain evidence that Thomas did not expect his readers to attempt to verify the account. 15> The economic logic for the practice of reprinting old news is clear: none of the expenses unique to a first edition (obtaining copy, licence, registration) but – if the gamble pays off – the benefits of a first edition: a brand new book (always more vendible than an old book, especially when it comes to news). It is the memorable nature of the narrative that makes it so surprising to us that such a work would be chosen to be reprinted as a new piece of news, but clearly both Trundle and Thomas thought they would get away with it. And the headless bear is not the only example of the practice of re-publishing old news in disguise; nor is the only time that Trundle and Thomas were to engage in it. It is the Printing of ‘hem makes ‘hem news to a great many, who will indeed beleeve nothing but what’s in Print. For those I doe keepe my Presses, and so many Pens going to bring forth wholsome relations, which once in halfe a score yeares (as the age growes forgetfull) I Print over againe with a new date, and they are of excellent use. 17> Trundle and Thomas at least waited slightly longer before reprinting old news. Characters in Jonson’s play The Staple of News (performed 1625, printed 1631) complain of similar practices: of Stationers ‘buttering ouer again... antiquated Pamphlets, with new dates.’ This time Jonson is punning on the name of news publisher Nathaniel Butter – was Butter guilty of republishing old news with new dates? I have found no examples of his doing so. Famous as being among the first to publish periodical news in England, Butter dealt almost solely in foreign news – undoubtedly many of his corantos contained news reprinted from elsewhere, but his sources would have been foreign reports, therefore this is hardly the same thing. 18> Jonson was exaggerating for comic effect, but his humour would surely have been lost if there was not at least some awareness of the practice occurring for real. As Joad Raymond writes, ‘news was not always so new’ – although the headless bear pamphlet is in fact the only example cited by Raymond of the specific practice of reissuing an old piece of news entirely disguised as a contemporary event. Matthias Shaaber gives only three pamphlet examples in his discussion of the phenomenon, one of which is Trundle’s Miracle, of Miracles. Jonathan Barry has uncovered an example involving a witch-trial from the later seventeenth century. Just how widespread the practice was in England is not clear: given the few known examples, one suspects that it was in fact not widespread at all, but it is true, given that by definition they were published in disguise, that finding other examples is extremely difficult. A look at some other known examples can however offer us a glimpse of the business at work. 19> Trundle’s Miracle, of Miracles is not limited to the encounter with the headless bear. The pamphlet also includes two other unrelated news reports, in separate sections: ‘a Prophesie reuealed by a poore Countrey Maide, who being dead the first of October last, 1613. 24. Houres, reuiued againe, and lay fiue dayes weeping, and continued prophesying of strange euents to come, and so died the 5. days following’; and ‘Lincolneshires Teares. For a great deluge, in which fiue Villages were lamentably drowned this present month.’ The second of these sections, the account of the Lincolnshire flood, is given a special title-page with Trundle’s imprint (though the signatures are continuous). It was the only part of the pamphlet mentioned in Trundle’s entry in the Stationers’ Register, and on that basis we may assume that it was genuinely new. The first of these sections, however, was another disguised reprint, as Gerald Johnson has pointed out: of a news report first published in England by William Wright in 1580 as A Prophesie Vttered by the daughter of an honest Countrey man, called Adam Krause. 20> The account is of a young woman who dies shortly after her brother’s wedding, but on an examination of her corpse she is found to be alive, and prophesies the approaching end of days, having seen an angelic vision. The 1580 pamphlet is itself a reprint, though in translation, of the account which, it says, was ‘First printed in Dansk, next at Lubick, then at Hambrough: and nowe at London’. As with the report of the bear, in his reprint Trundle has changed the dates but not the names or places. That is, except for one name: Eyriak Schlichtenberger, Superintendent of Melwing, who according to the title-page of the 1580 version was the author of the account, becomes in Trundle’s version ‘Knact Clighton, Berger and Superintendent of Melwing’ (with no hint that he was the author). The emendation offers a glimpse of the producers at work: whoever it was that was editing this account, they were dictating it. 21> All the reports in this pamphlet are clearly supposed to be new news, not reprints of older works. Johnson suggests that Trundle made his living predominantly by obtaining material to be published, whether manuscript news reports, play scripts, translations of foreign reports, etc. When unable to obtain anything new, he clearly had no qualms about turning to reports he assumed had been forgotten. A Miracle, of Miracles is not the only time Trundle is known to have re-packaged old news: his Three Bloodie Murders (1613) was also in part a reprint of an earlier pamphlet; the report of the first of the three murders is a reprint of The Manner Of The Crvell Ovtragiovs Mvrther Of William Storre, printed at Oxford in 1603, with some slight rearrangement and removal of dates. Once again names of witnesses (this time long lists of them) are included unaltered. A mere decade separating their publication, this reprint is perhaps an indication of how little Trundle thought news published at Oxford would have penetrated the capital. 22> As publisher Trundle rarely strayed from the cheaper end of the print spectrum, gaining something of a reputation as a result of his speciality for sensational news. Alexandra Walsham calls Trundle ‘arguably the most enterprising – and unprincipled – publisher of the early Stuart age.’ His notoriety was such that his name made it to the stage, the truthfulness of his publications was attacked in print, and he was being mentioned in ballads long after his death. His modern notoriety stems in large part from the fact that he was co-publisher of the first quarto of Hamlet (the ‘bad’ quarto). He is also well-known for – and his unscrupulousness is well demonstrated by – the publication of an entirely fictitious ‘news’ pamphlet, True and Wonderfull. A Discourse relating a strange and monstrous Serpent (or Dragon) late discouered, and yet liuing... in Sussex (1614). This pamphlet also includes a – presumably entirely fictional – list of witnesses. It is hardly surprising that it was such a man who had the gall to republish as a totally new occurrence so memorable an event as the headless bear haunting. The serpent pamphlet may well have been tongue-in-cheek, however, and was not necessarily meat to be taken at face value – its originators thought it was true but it may have been published so London readers could enjoy laughing at their credulity. It seems highly plausible that we could apply a similar reading to the headless bear and other similar works. 24> As with the headless bear pamphlet, names have been changed, but not always unrecognisably so. Dates and places have been changed, this time from Germany to England. These are certainly real places: Carlton-in-Lindrick is around three miles north of Worksop and just to the south of Blyth. Are these also the names of real people, as in the Durham pamphlet? A nineteenth-century editor, not realising the 1641 account was a reprint, made some effort to trace the death of the maid and the wedding of her brother in parish registers, and was unsuccessful. My own researches have uncovered that there was, at least, a Sir Francis Thorney in Nottinghamshire around the mid-seventeenth century. Once again Thomas appears to have drawn on someone with local knowledge to give his reprint the appearance of credibility. 25> A high degree of editing has taken place; it is not mere laziness that lies behind the reprint. Another notable change is to the request made by the maid for communion, after she has prophesied (and before she dies for real). Where Trundle’s version reads ‘she was desirous to receiue the Sacrament, and Christian Communion of the body and blood of Christ’, Thomas’s version reads ‘she was desirous to receive the Sacrament, and Christian Communion of the Church of England, (exhorting them to be ware of the whore of Babylon)’. Thomas is clearly keen to situate the maid’s prophecies and her angelic vision firmly in an English Protestant context. The prophecy itself certainly does not seem out of place in the millenarian atmosphere of the 1640s, although no effort is made by its editor to make it any more specific to the particular time in which it was reprinted. 26> Little is known about John Thomas. He was in business, as far as we can tell, for just a few years. Extant publications begin in the early 1640s; a very large number of imprints bearing his name survive from 1641 and 1642; they then tail off and his latest known publication is from 1645. Like Nelson and Trundle he was almost solely a publisher of topical pamphlets, in Thomas’s case mostly relating, as one would expect, to the progress of the Civil War. The two reprinted pamphlets do stand out, in that they are not related to the Civil War – but Thomas certainly does not seem to have been short of material to print, during these years at least. Their reprinting does not, on the surface, appear an act of desperation, so they must have been considered lucrative properties. 27> Another example of the practice is, curiously enough, another possession pamphlet, from around the same time as A Miracle, of Miracles. A pamphlet of 1574 entitled A booke declaringe the fearfull vexasion, of one Alexander Nyndge was reprinted in 1615 as A Trve And Fearefvll Vexation Of One Alexander Nyndge, giving the same days of the month but omitting to mention the year in which events took place. Once again a list of witnesses is reprinted exactly as it appears in the original, give or take the odd difference in spelling – and again the fact that there are witnesses is advertised on the title-page of the reprint, further evidence that such lists were a selling-point. But this is not a straightforward verbatim reprint. The reprint makes substantial additions, including a moralising preface on the nature of the Devil, in the standard manner of sensational news pamphlets of the period, and at the end of the report two generic ‘prayers’. Then the spirit (for a small time) racked the said Alexander in a far more cruell manner: for he did vse such strange and idle kinds of gestures in laughing, dancing, and such like light behaviours, that he was suspected to be mad: sundry times he refused all kinds of meat for a long space together, insomuch as he seemed to pine away. Sometimes he shaked as if he had had an ague. There was heard also a strange noise or flapping from within his body, Hee would gather himselfe on a round heape under his bedcloathes, and being so gathered, he would bounse up a good height from the bed, and beat his head and other parts of his body against the ground, and bed-stead in such earnest manner, that the beholders did feare that he would thereby have spoiled himselfe, if they had not by strong hands restrained him, and yet thereby he received no hurt at all. 29> The added material is itself taken from another pamphlet, A Trve Narration Of The Strange And Grevovs Vexation By The Devil, Of 7. Persons in Lancashire, And William Somers of Nottingham (1600), by the Puritan exorcist John Darrel, one of several he wrote about his exorcising escapades. This borrowing has been missed by modern scholars, including a modern editor of the Nyndge pamphlet, demonstrating the importance of understanding the full textual history of printed works before attempting to draw evidence from them. The material taken from Darrel is clearly intended to make the Nyndge narrative more interesting and sensational for its readers. That it was also ‘borrowed’ from an earlier work indicates the lengths to which the editor was prepared to go in order to spice up the pamphlet. This is no merely casual reprinting, but a work for which a level of research has been undertaken. STC suggests the publisher was William Barrett; Barrett was a relatively well-established publisher, certainly not one to fall to desperate measures to make money. 30> As it happens, part of Darrel’s Trve Narration itself – the section on Sommers (pages 14-20) – was itself reprinted in 1641, by printer and sometime publisher Thomas Harper, as A True Relation Of The grievous handling of William Sommers of Nottingham, Being possessed with a Devill. Darrel’s name is on the title-page, but all the dates are once again removed from the narrative, so this does seem to be another instance of a possession pamphlet being reissued in disguise. Harper was in business for most of the first half of the seventeenth century, mostly involved in the production of religious and medical works, with the odd play and other miscellaneous works. He began printing topical pamphlets in the 1640s, but they are rarities in his output. I have not uncovered any further reprints. Once again, he was a well-established Stationer, not apparently short of material to publish. Scholars have suggested that the Darrel case made quite an impact, given the involvement of the highest echelons of the ecclesiastical hierarchy, and the number of printed works which appeared in relation to it. This reprint suggests that either the impact of the case was not as large as has been assumed, or that it had been forgotten by the 1640s. 31> It was rare for news pamphlets to see even a legitimate second edition in England during the period, given their inherent topicality; and given the small size (both commercially and geographically) of the English book trade there was presumably little demand. What is striking about these examples is precisely that they were so striking, the headless bear most of all. Events that we might consider shocking and memorable could be comfortably passed off as new – and as forgotten – a generation later. This is a reminder to us not to be over-hasty in blurring chronological distinctions when studying the period. We should not assume that events reported in print had an impact beyond any time-frame for which we have evidence. Thirty years could be as long a time in publishing in the seventeenth century as it is now. 32> It is perhaps because such incidental, provincial news stories could theoretically happen at any time, and were difficult to verify, that reports of them were ripe for republishing – unlike political news, for example, which would be easier to substantiate. That all the examples discussed here were reports of supernatural events of some kind only contributes to the morass of uncertainty surrounding such events, both for modern scholars as well as, presumably, for contemporary readers. It was precisely the existential uncertainty of such narratives that opened them up to republishing in entirely fabricated circumstances. We should be very careful indeed when reading such productions for the evidence they might provide about real events. 33> It is not known how widespread the practice was, given the difficulty of identifying examples. Even if it was a rare practice, it is no wonder there was so much anxiety about the veracity of printed news during the period, and so much effort on the part of publishers to prove that their news was true. These examples show how even those devices publishers used in their attempts to establish truthfulness – most notably lists of witnesses – could be completely false. Listing witnesses supposedly willing to testify to the veracity of the account was a key method by which early modern news publishers attempted to inspire trust in their readers, and to mark out the discourse of news as something true, something more than mere fiction. That they were considered a selling point is clear from the way they were regularly advertised on the title-pages of pamphlets. That they could be entirely fictional – or even the names of real people totally unconnected with the events beings reported – surely speaks volumes about what publishers really thought of them. Ironically, it was presumably as a direct result of such unscrupulous practices as those discussed here that the authors and producers of early modern reportage felt the need to go to such pains to provide external verification for their reports. These examples suggest that some publishers at least did not expect their readers to bother actually contacting any of the witnesses they listed. What, one wonders, did the readers themselves make of them? 34> A detailed look at these examples, however, shows that these pamphlets were not the crudest of productions by the poorest of Stationers. They were produced by people who knew their business, and who were often not short of material to publish; and the reprints often involved a relatively sophisticated degree of editorial work. In at least one instance this was intended to make the account more sensational. The commercial value of these narratives is unquestionable, and this was more valuable to their publishers than the reports’ value as truthful news. Perhaps it was the very extraordinariness of these narratives that gave them such value and made them worth reprinting. After all, what would be the point of reprinting an uninteresting piece of news? We may also be missing the point when focussing on the truthfulness (or otherwise) of such reports: as with the Sussex serpent, perhaps these publications are not meant to be taken seriously, and represent a sophisticated London readership laughing at the gullibility of provincials. There are implications here for the early modern news trade as a whole. When it came to news – then as now? – entertainment was more important than truth. 35> What of the headless bear itself? That the Devil could appear in a wide variety of horrifying animal shapes was standard belief during the period, its roots deep in folklore (and relatively unaffected by the Reformation). 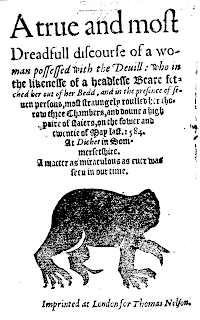 A ghostly bear, though with its head attached, appears in a report of a murder from 1591, while demonic bears appear occasionally in witchcraft narratives during the 1640s.As for a specifically headless demonic bear, Charles Rahter notes that the 1584 pamphlet is only the first confirmed appearance of such an apparition, and writes that ‘when the mass of this popular literature is properly surveyed and recorded, it may turn out to be much older than that.’ A search of the EEBO-TCP database offers only an intriguing addition to the puzzle. There is a mention in Foxe’s Acts and Monuments, in a list of godly who were ‘grieuously disquieted’ during the reign of Henry VIII, of one W. Webbe who suffered ‘Because hee set the Image of a headlesse Beare in the Tabernacle of S. Roke.’ This reference, therefore, was printed later than the possession pamphlet, but it describes an earlier event. Sadly therefore we cannot be sure whether this was an unconscious recollection of Nelson’s pamphlet, or whether it was indeed a real occurrence, and if it was the symbolism of the headless bear is not made clear. Through bog, through bush, through brake, through briar. 37> The resonance here is not mere horror, and what necessity there is for the bear to be headless is not clear. A modern editor of the play, Peter Holland, suggests it evokes diabolic associations, but that would surely only be the case if audiences knew of the pamphlet, and it does not seem obvious that this would have been the case. More likely mere weirdness is the intended resonance, for which a reading of the pamphlet may have been recalled by Shakespeare. My sad and dismall soule affrightes. 39> We can surmise that Burton took the image from Trundle’s pamphlet, because he owned the copy of the pamphlet now in the Bodleian, and must have recalled the image when calling to mind examples of the many horrific phantoms known to have appeared to the possessed or otherwise demonically distracted. 41> Baxter notes that subsequently Jones ‘lived Honestly, Religiously, and without blame’, clearly aware of the doubts such a story might raise in his readers. It is a tantalising lead; was Jones (or Baxter?) a reader of Shakespeare, or of one of the news pamphlets? Or is there just enough here, and in Foxe, to hint at the possibility that the headless bear had an existence beyond the printed page as part of wider cultural consciousness? A true and most Dreadfull discourse of a woman possessed with the Deuill (London: Thomas Nelson, 1584). For a recent overview of the history of diabolic possession see Brian Levack, The Devil Within: Possession and Exorcism in the Christian West (New Haven and London: Yale University Press, 2013). A true and most Dreadfull discourse, A3r-A3v. See Peter Lake with Michael Questier The Antichrist’s Lewd Hat – Protestants, Papists and Players in Post-Reformation England, (New Haven & London: Yale University Press, 2002), chapters 4 & 5; Alexandra Walsham, Providence in Early Modern England (Oxford: Oxford University Press, 1999), chapter 1. A true and most Dreadfull discourse, A8r. See the introduction in Frances E. Dolan, True Relations – Reading, Literature, and Evidence in Seventeenth-Century England (Philadelphia: University of Pennsylvania Press, 2013). Another version of the pamphlet exists entitled The Miracle, of Miracles (rather than A Miracle, of Miracles); the text is entirely re-set, but only a few minor corrections have been made. Both versions exist in only one known extant copy; the title-page of the copy of The Miracle, of Miracles has been cropped, so its date is unknown. It could plausibly be a second edition, indicating that the pamphlet was a commercial success. E.g. by Marion Gibson, Reading Witchcraft – Stories of Early English Witches (London: Routledge, 1999), p. 221, n. 13. A true and most Dreadfull discourse, A3v. I., T., A Miracle, of Miracles (London: for John Trundle, 1614), A3v. A true and most Dreadfull discourse, A8r; A Miracle, of Miracles, B3v. E. Arber, A Transcript of the Register of the Company of Stationers of London; 1554-1640 A.D. (5 vols; Gloucester, MA: Peter Smith, 1967), vol. iii, p. 537. Most Fearefull and strange Nevves From the Bishoppricke of Dvrham (London: for John Thomas, 1641), p. 6. M. A. Richardson (ed. ), Most Fearefull and Strange Newes from The Bishoppricke of Dvrham (Newcastle: M. A. Richardson, 1843), pp. 5-6. Robert Surtees, The History and Antiquities of the County Palatine of Durham, 4 vols (London: J. Nichols & Son, 1816-40), vol. ii, p. 367. Ben Jonson, Newes From The New World Discover’d In The Moone in C. H. Herford, Percy & Evelyn Simpson (eds), Ben Jonson (11 vols; Oxford: Clarendon Press, 1925-1952), vol. vii, p. 515, lines 61-67. Jonson, The Staple of Newes in ibid., vol. vi, p. 295, I.v.58-61. On Butter, see Leona Rostenberg, ‘Nathaniel Butter and Nicholas Bourne, First ‘Masters of the Staple’, The Library, 5:12 (1957), 23-33. Joad Raymond, Pamphlets and Pamphleteering in Early Modern Britain (Cambridge: Cambridge University Press, 2003), p. 124. Raymond’s other example, Newes from Ireland, states that it is a reprint, and in any case appeared in the same year as the original report. Julia Schleck suggests the practice was common, but also gives just a single example, ‘‘Fair and Balanced’ News from the Continent: English Newsbook readers and the thirty years war’, Prose Studies: History, Theory, and Criticism, 29:2 (2007), 325. M. A. Shaaber, Some Forerunners of the Newspaper in England 1476-1622 (Philadelphia: University of Pennsylvania Press, 1929), pp. 290-92. Jonthan Barry, Witchcraft and Demonology in South-West England, 1640-1789 (Basingstoke: Palgrave Macmillan, 2012), p. 78. Gerald D. Johnson, ‘John Trundle and the Book Trade, 1603-1626’, Studies in Bibliography, 39 (1986), 194. Eyriak Schlichtenberger, A Prophesie Vttered by the daughter of an honest Countrey man, called Adam Krause (London: John Charlewood for William Wright, 1580), A7v. Printing translations of Continental news reports was a common practice. Ibid., A7v; A Miracle, of Miracles, C4r. The Manner Of The Crvell Ovtragiovs Mvrther Of William Storre (Oxford: Joseph Barnes, 1603). I have not traced the sources of the other two narratives in Three Bloodie Murders (London: for John Trundle, 1613), so it is not clear if they are also reprints of older pamphlets. The pamphlet does not appear to have been registered. See Johnson, ‘John Trundle’, 177-78. True and Wonderfull. A Discourse relating to a strange and monstrous Serpent (or Dragon) lately discouered (London: John Trundle, 1614), C3r. See Andrew Hadfield, ‘News of the Sussex Dragon’, Reformation, 17 (2012), 99-113. A Miracle, of Miracles, B4r. The Wonderfull works of God. Declared By A Strange Prophecie Of a Maid, that lately lived neere Worsop in Nottingham-shire (London: for John Thomas, 1641), A4v. John Holland, The History, Antiquities, and Description of the Town and Parish of Worksop, in the County of Nottingham (Sheffield: J. Blackwell, 1826), pp. 138-39. See Robert Thoroton, The Antiquities Of Nottinghamshire (London: Robert White for Henry Mortlock, 1677), p. 344. Thorney was a lord of the manor of Knapthorpe, near Carlton-on-Trent but the other side of the county from Carlton-in-Lindrick. A Miracle, of Miracles, C3r; The Wonderfull works of God, A4v. STC suggests that the author of the pamphlet(s) was Edward Nyndge, brother of the demoniac, but in fact only the 1615 edition claims to have been written by Edward; both versions refer to Edward in the third person. A Booke Declaringe the Fearfull Vexasion, of one Alexander Nyndge. Beynge moste Horriblye tormented wyth an euyll Spirit (London: Thomas Collwell, 1574? ), A2v. A Trve And Fearefvll Vexation Of One Alexander Nyndge: Being Most Horribly Tormented with the Deuill (London: for W. B. to be sold by Edward Wright, 1615), A3v. A Trve Narration Of The Strange And Grevovs Vexation By The Devil, Of 7. Persons in Lancashire, And William Somers of Nottingham (S. l.: s. n., 1600), pp. 15-16. On Darrell, see Marion Gibson, Possession, Puritanism and Print: Darrell, Harsnett, Shakespeare and the Elizabethan Exorcism Controversy (London: Pickering & Chatto, 2006). See e.g. Andrew Cambers, ‘Demonic Possession, Literacy and ‘Superstition’ in Early Modern England’, Past and Present, 202 (2009): p. 5, n. 4; Philip C. Almond, Demonic Possession and Exorcism in Early Modern England: Contemporary Texts and their Cultural Contexts (Cambridge: Cambridge University Press, 2004), pp. 1, 43-44. Even the woodcut on the pamphlet’s title-page is taken from an earlier pamphlet, where it has slightly more relevance to the narrative; a monstrous birth pamphlet entitled A True Relation of the birth of three Monsters in the City of Namen in Flanders (London: Simon Stafford for Richard Bunnian, 1609). It is reasonable to assume that the preface and the prayers may also have been taken from other works, but if this is so I have been unable to identify their origin. See Walsham, Providence, pp. 186-94. Sundry strange and inhumaine Murthers, lately committed (London: Thomas Scarlet, 1591), B4v; John Davenport, The Witches Of Hvntingdon (London: William Wilson for Richard Clutterbuck, 1646), p. 3; Matthew Hopkins, The Discovery of Witches (London: for Richard Royston, 1647), p. 3. Hopkins also, curiously enough, reports a spirit in the shape of a human child without a head, p. 2. Charles A. Rahter, ‘Puck’s Headless Bear – Revisited’ in Ronald Dotterer (ed. ), Shakespeare – Text, Subtext, and Context (London and Toronto: Associated University Press, 1989), p. 162, n. 9. John Foxe, The second Volume of the Ecclesiasticall Historie (London: John Day, 1597), p. 1207. William Shakespeare, A Midsummer Night’s Dream, ed. Peter Holland, (Oxford: Clarendon Press, 1994), III.i.101-106, and see Holland’s note. Robert Burton, The Anatomy Of Melancholy (3rd ed. ; Oxford: John Lichfield for Henry Cripps, 1628), **2r. As pointed out by Percy Simpson, Studies in Elizabethan Drama (Oxford: Clarendon Press, 1955), p. 94. See Nicolas K. Kiessling (ed. ), The Library of Robert Burton (Oxford: The Oxford Bibliographical Society, 1988), p. 163. Richard Baxter, The Certainty Of The Worlds of Spirits (London: for T. Parkhurst & J. Salisbury, 1691), pp. 58-59. Simon F. Davies was awarded his PhD from the University of Sussex in 2013, for a study of English printed writing on witchcraft using the methodologies of the history of the book. He co-edited the volume News in Early Modern Europe for Brill, and has recently completed an edition of Edward Poeton’s manuscript treatise on white witches.